Boy cuts are bang on trend again in the best short hairstyles 2015! This makeover takes a fairly short hairstyle and takes it even shorter in a bold cut that’s incredibly easy to style. The basic shape follows the popular short back and sides popular in this year’s men’s haircuts and uses texture and colour to add interest. 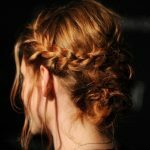 If you’re one of the many women plagued by hair that refuses to stand up around the crown, leaving you with a horrid flat section, why not try this style! Instead of constantly fighting gravity to force hair into a nicely rounded crown shape, the new short hairstyles are making the crown a feature. The latest short haircuts style hair forwards to the face and the hair around the crown is allowed to lie in its natural state. This gives the appearance of curved petals radiating out from the centre of a flower, just like a chrysanthemum! The ‘petals’ are highlighted with warm copper-blonde tones and all you need to do is add a blob of styling wax to keep the tousled shape all day!